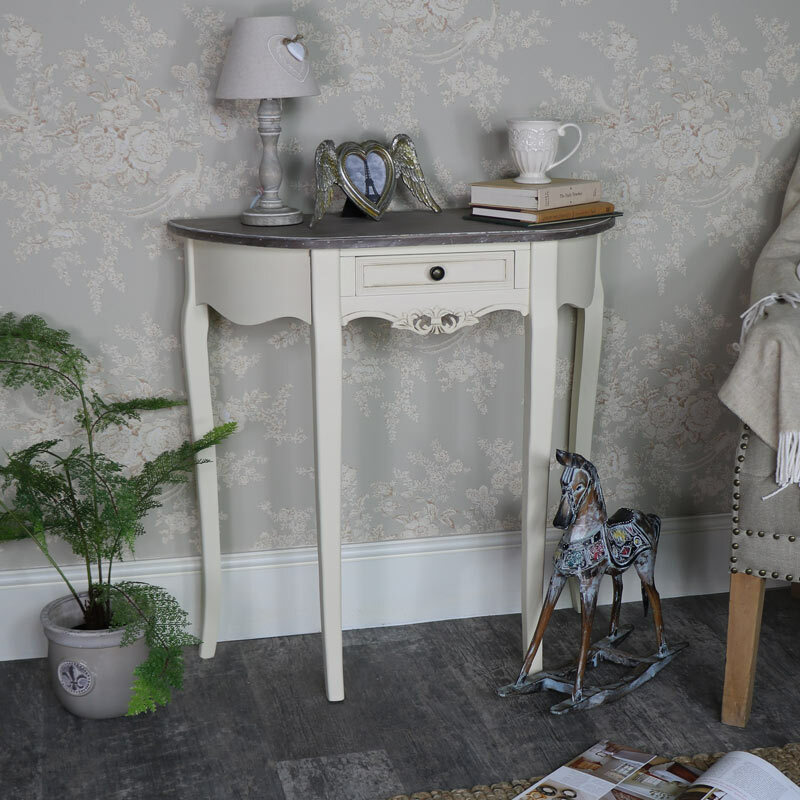 This is the stunning half moon console table from our beautiful, country and Frnehc style Georgette Range. Elegant bedroom and living room furniture in a rustic cream finish, featuring delicate curves and ornate carving, with driftwood top and spacious drawers for storage. A wonderful piece of furniture that will fit comfortably in the hallway or living room. With 1 drawer storage, this console table is practical as well as attractive. Brass button drawer knob, ornate carved detailing on the front and elegant curved legs that add to the appeal. This half moon console table will look fantastic alongside the other pieces in our Georgette Range. With furniture for your living room, hallway and bedroom, you can dress your home up in stunning French country chic. 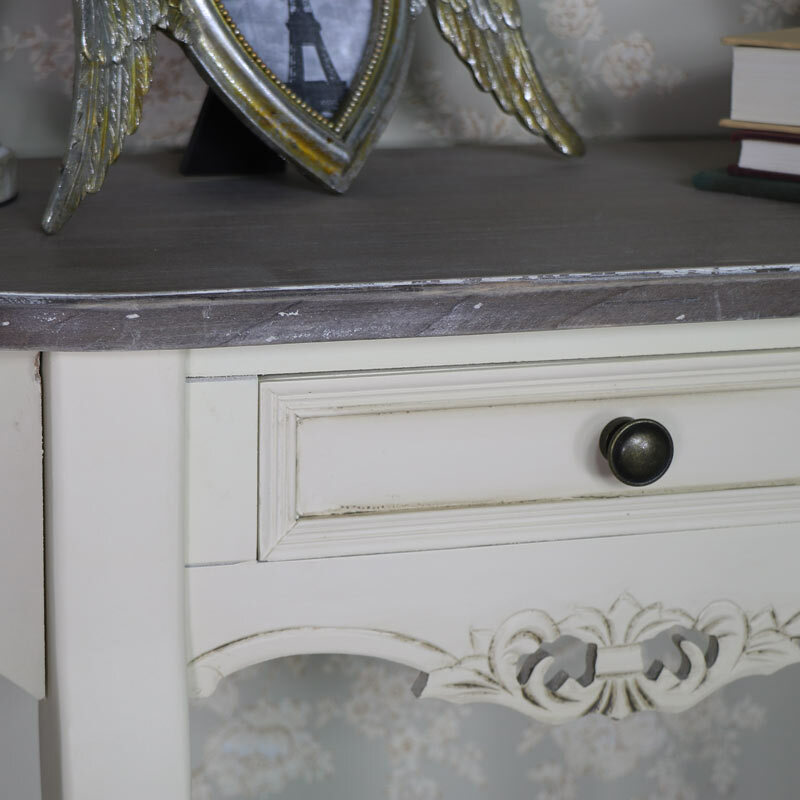 This is the stunning half moon console table from our beautiful, country and Frnehc style Georgette Range. Elegant bedroom and living room furniture in a rustic cream finish, featuring delicate curves and ornate carving, with driftwood top and spacious drawers for storage. A wonderful piece of furniture that will fit comfortably in the hallway or living room. With 1 drawer storage, this console table is practical as well as attractive. Brass button drawer knob, ornate carved detailing on the front and elegant curved legs that add to the appeal. This half moon console table will look fantastic alongside the other pieces in our Georgette Range. With furniture for your living room, hallway and bedroom, you can dress your home up in stunning French country chic. Made from wood and painted in a rustic cream colour with mild distressing and a natural wood top in a limed finish.The drawer measures 24.5cm x 5.5cm x 20.5cm (width x height x depth). this table comes partially assembled with just the legs to fix to the table top. With a wide range of furniture to choose from, our Georgette Range is a fantastic choice. Yes, the legs need attaching to the table top. The drawer and top is made from MDF with the sides and legs made from a Pine wood. Delivery is with one of our smaller couriers and takes 1-3 working days.